InGen‘s process was always under constant refinement as indicated by the dinosaur fetuses present in the third film, but it runs as deep as the source material of the novels as well. Outside of this one can clearly see that it is evident purely from plain common sense on how genetic cloning of an animal works and the desire to come out with an ideal specimen that is devoid of crippling or even a negative mutation. Genetic manipulation of the dinosaurs present would be forced to match what would be the public perception of dinosaurs at that point in time contrary to instead what the scientific consensus at the time. This is clearly stated in the fourth film that if the animal used the full genome it would look a lot different as per Henry Wu. This gives a way to explain away the differences of the animals in the series versus what is proven scientifically from paleontologists around the world about these animals and even explains the fact that while science marches on in progress the films are stationary in certain aspects. Jurassic Park’s dinosaurs clearly have some shortcomings when compared to their real-life counterparts. For example, most modern theropods are considered feathered and assuredly all lack the rotated ulna and pronated hands (or bunny hands) present in the film series. So how do we know there were version numbers? What evidence is there for this? Aside from the source and plain common sense the animals would need to be experimented on and refined we have an in-film piece of evidence to your left. Notice where the red circle is, that’s a version number right there or at least what we believe to be one from an educated guess. For those who have trouble seeing it reads: “2.05” for the Stegosaurus (incorrectly spelled “Stegasaurus”) embryo. The animals were treated as software as well, and like software there is a process in placing it under constant revision for improvements/refinements. An example of this would be something purely cosmetic on down to behavioral inhibitors even. These dinosaurs, being a science project themselves sponsored by InGen and its investors, would logically be under constant revision to match the public perception or at least reconcile the differences in other ways. We can safely assume that the science from the novel canon obviously carries over in some watered down capacity for the film-going audience. For the film to be made such things would have to be watered down as possible because people want to be thrilled. To your right you’re seeing the aborted fetus of two dinosaurs seen in the Embryonics Administration scene along with a prop used in the production. These are obviously failed attempts at the dinosaurs that InGen studied to learn more about their process, likely to refine/revise how they were producing dinosaurs. These would not exist if the process was either squeaky clean (which would be unrealistic) or not under constant revision to make the “perfect” theme park inhabitant. Thus variation and the carry over of version numbers do in fact translate over into the film end of the continuity. 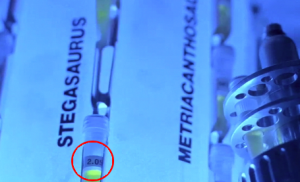 Lastly, In Jurassic World, this idea is given further credence and support by being alluded to in a conversation between Henry Wu and Simon Masrani regarding that the dinosaurs would look a lot different if they were using the full genome when Masrani confronted Wu about the Indominus. Nothing in Jurassic World is natural, we have always filled gaps in the genome with the DNA of other animals. And if the genetic code was pure, many of them would look quite different. But you didn’t ask for reality, you asked for more teeth. This notion was addressed earlier, but it is mentioned again to send the point home that the science was imperfect, the dinosaurs were imperfect and needed revision in order to be incorporated into their desired use by InGen in the end. This doesn’t mean they couldn’t be accurate at one point, but it does explain away the arguments of accuracy because of InGen wanting to meet the public’s perception instead of paleontologist’s perception of these animals. John Hammond‘s goal was to design a theme park that allowed mankind to see into its past. The goal was not for people to get injured or worse, killed, by his “attractions” though. In the novel, while Hammond‘s goals were roughly the same it isn’t accompanied with the altruistic approach of his film’s counterpart though. If anything he’s more money hungry in the book than the film. The desire there is to make and hoard a lot of money doing it and basically extorting the science involved to his advantage. This is different from the film counterpart of the character as Hammond was portrayed more congenial as a sympathetic dreamer with the best of intentions involved in with wanting everybody to enjoy his attractions and to help humble mankind. This personality is eventually carried over by Simon Masrani in Jurassic World itself with Henry Wu representing the ambiguous morality and dubious nature of the novel canon’s incarnation of John Hammond. With all scientific experimentation and moral implications considered with InGen’s actions in bringing the dinosaurs back to life, the aim was always to create a theme park enjoyed by all. So the overall intention was to humble mankind and give people something they can enjoy. A lot of the nefarious methods are research were done most likely out of the way from Hammond though. 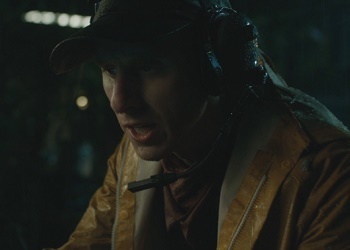 Outside of this we have Hammond’s nephew, Peter Ludlow seizing power in the beginning of the second film, but his place is to save InGen by extorting the use of the animals on Site B to open up and complete Jurassic Park: San Diego. 1. Is it right to clone an extinct animal from an extinct ecosystem and sell it as a product as entertainment? 2. Is it right to disrupt an established living ecosystem with an extinct animal? 3. What about the welfare of the recreated animals as well as the welfare of the current animals and their ecosystem? Often what one considers good or evil here is a matter and subject to people’s beliefs or feelings. As such, this concept is again explored in Jurassic World regarding the implications of making a hybrid such as the Indominus Rex, but Masrani clearly wanted a new exciting attraction, while Wu was interested in expanding and pushing the limits of the science, simultaneously Hoskins was using the whole affair to push up the relevance of his branch of InGen where it is tied to the security units as well as military contracts and applications. 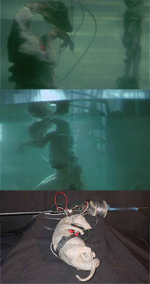 The Jurassic series focuses on the morality of resurrecting long extinct species through the miracle of bio-engineering along with pushing the limits of the science while also shouldering the responsibility that humanity has in their recreation to drive a cautionary point home to the audience that one must be careful when exploring and breaking limits due to a potential catastrophic failure of the situation. Such morality observations are showcased through characters like Ian Malcolm, Alan Grant, and recently original characters such as Owen Grady and Claire Dearing. It does this to encompass a rich story that serves as a cautionary tale of man pushing the limits of science for less than noble purposes and even noble purposes, along with trying to control nature, and even overcome nature themselves.